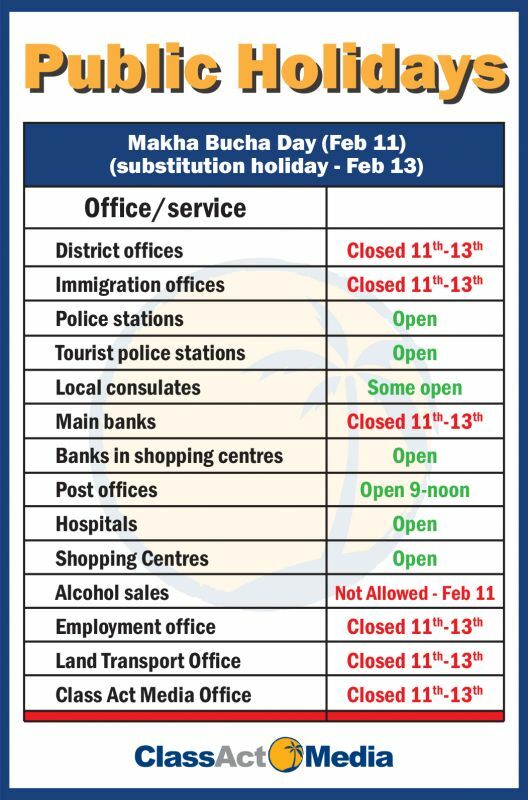 PHUKET: The commander of the Phuket Provincial Police, Maj Gen Teeraphol Thipjaroen, has called for all vendors of alcohol across the island to observe the ban on the sale of alcohol for the Buddhist holiday Makha Bucha on Saturday (Feb 11). The alcohol ban will be in effect from midnight Friday night through to midnight Saturday night. Right-click on image and open for high-resolution version. The ban, instituted by law, will be in effect from midnight Friday night through to midnight Saturday night, Gen Teeraphol confirmed. “Please note that the ban will not be in effect on the substitution day public holiday on Monday (Feb 13) . The sale of alcohol on that day can proceed as usual,” Gen Teeraphol told The Phuket News. However, he warned against the sale of alcohol during the ban on Saturday. “Under Section 39 of the Alcohol Control Act, the penalty is up to six months in prison, a fine of up to B10,000, or both,” he said. “Anyone wanting to report breaches of the act can call the police hotline 191, or the Tourist Police hotline 1599. Both numbers are monitored 24 hours a day,” Gen Teeraphol said. The Prime Minister’s Office on January 22, 2015 announced that the sale of alcohol is banned by law on five religious days in Thailand: Makha Bucha, Asanha Bucha, Visakha Bucha, Khao Pansa and Wan Org Pansa days. The ban affects the sale of alcohol everywhere throughout the country, except duty free shops at international airports. 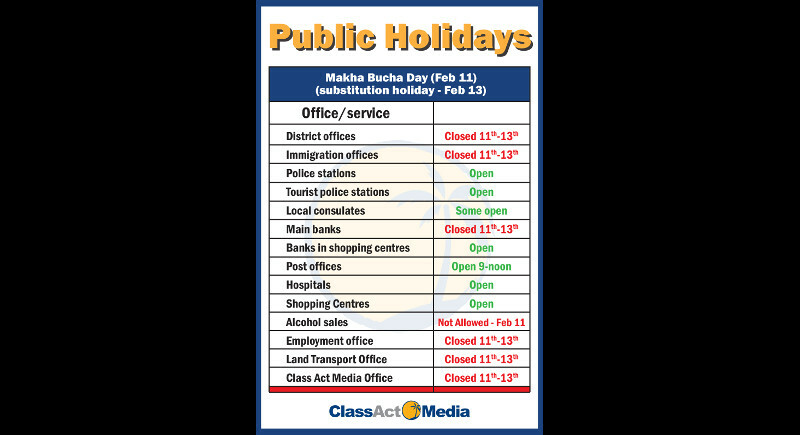 The Class Act Media offices will be closed Saturday (Feb 11) as usual and on Monday (Feb 13) to mark the Makha Bucha public holiday – but will re-open on Tuesday (Feb 14), in time for Valentine’s Day. Wow, 6 months in prison or and possible up to a fine of 10,000 thb! That is different cake compared with 500 thb fine for a minivan driver maniac who loose control of his vehicle with passengers on a visa run trip.